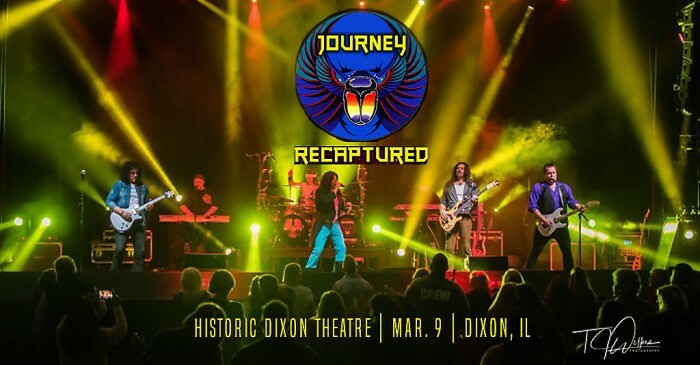 The Historic Dixon Theatre presents JOURNEY RECAPTURED featuring Bob Biagi, and all of the lights, sounds, and Journey-esque atmosphere you would expect. This is not a cover band, but a group of talented musicians and vocalists who have perfected every nuance of what made Journey the Super Group they are. When you put this history of great music together, with a great band that has the talent, passion, dedication to perfection, the sound, and following “JOURNEY RECAPTURED” has, the night will turn into magic. And the songs, sounds, and memories it will bring back will be, “RECAPTURED”!